Channel One Regional Food Bank is pleased to announce the recipient of the 2016 Food Bank Donor of the Year Award. Bushel Boy Farms, which produces fresh, vine-ripened tomatoes year-round, received the award for their efforts to help end hunger through their consistent and generous donations of fresh, healthy tomatoes. Since 2004, Bushel Boy has donated hundreds of thousands of pounds of their locally grown, greenhouse tomatoes. Grown in a facility encompassing 28 acres in Owatonna, Bushel Boy sends fresh tomatoes daily to retailers in and around Minnesota. 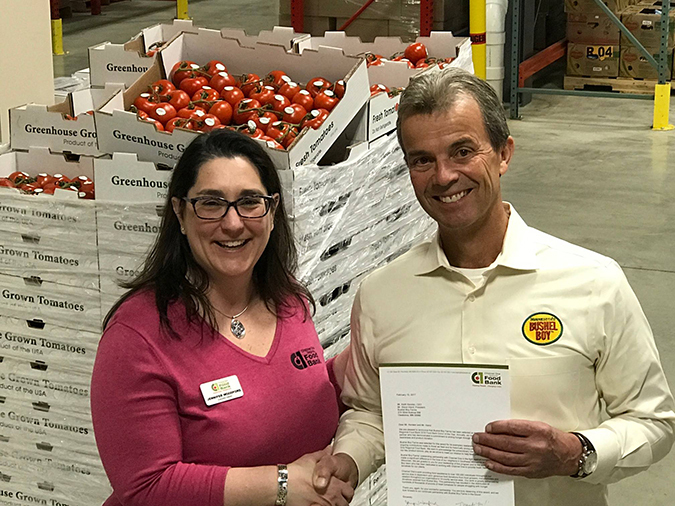 Whenever Bushel Boy has a surplus of tomatoes, they partner with Channel One in their efforts to end hunger by getting them into the homes of clients in need. Whether Bushel Boy delivers to Channel One, or a Channel One truck picks up at Bushel Boy, their coordinated efforts help ensure these fresh and healthy tomatoes are put to good use. “We are incredibly grateful to Bushel Boy for their generous support and amazing donations through the years. It is wonderful to see our client’s faces light up with excitement when we have juicy, red Bushel Boy tomatoes for them to take in our Food Shelf!” said Jennifer Woodford, executive director of Channel One Regional Food Bank. “Bushel Boy Farms is a pioneer in extending the growing season in Minnesota, and we take pride in providing fresh, healthy produce to help families in need get good nutrition,” said Steve Irland, Bushel Boy President. Channel One provides food assistance to over 100,000 individuals throughout the 14-county service area of Southeast Minnesota and La Crosse County, Wisconsin, and depends on the generous food donations from distributors, growers, manufacturers and retailers. Bushel Boy’s partnership with Channel One makes a difference in the fight against hunger. Learn more about Channel One Regional Food Bank.